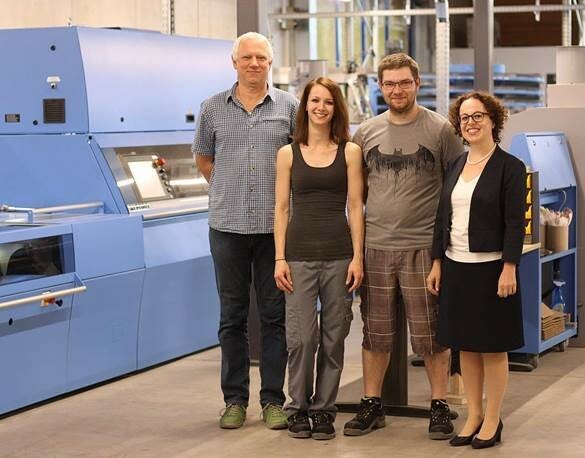 The Lustenau book printing plant (BuLu) has gained a unique combination of advantages by investing in a Muller Martini Alegro perfect binder. Environmentally-friendly PUR glue, stabilizing PUR side gluing and automatic glue application monitoring have made all the difference. Together those factors ensure top-quality perfect binding for spine thicknesses of 1 mm to 6.5 cm. The Austrian book printing plant Lustenau (BuLu) stands for tradition and stability, as well as corporate responsibility towards its customers, suppliers, staff and the environment. Thanks to consistent investments, continuous benchmarking and external certification, the company’s products are of an extremely high quality. Their haptic and visual appeal ensures the loyalty of BuLu’s customers in the German-speaking countries. “Today customers expect a wide range and quick turnaround times, so the Alegro perfect binder is a key step ahead for us,” says BuLu Managing Director Christine Schwarz-Fuchs. The BuLu perfect binder team together with Managing Director Christine Schwarz-Fuchs (right).